Chapter 1: J.P. McCalpin and A.R. Nelson, Introduction to Paleoseismology. The Scope of Paleoseismology. Identifying Prehistoric Earthquakes from Primary and Secondary Evidence. Prehistoric Earthquake Recurrence and Dating. Estimating the Magnitude of Prehistoric Earthquakes. The Early Development of Paleoseismology. Chapter 2: J.P. McCalpin, Field Techniques in Paleoseismology: Introduction. Mapping Paleoseismic Landforms. Mapping Paleoseismic Stratigraphy. Distinguishing Paleoseismic Features From Non-Seismic or Non-Tectonic Features. Specialized Subfields of Paleoseismology. Chapter 3: J.P. McCalpin, Paleoseismology of Extensional Tectonic Environments: Introduction. Geomorphic Evidence of Paleoearthquakes. Stratigraphic Evidence of Paleoearthquakes. Dating Paleoearthquakes. Interpreting the Paleoseismic History by Retrodeformation. Distinguishing Tectonic from Non-Tectonic Normal Faults. Chapter 4: W.R. Hackett, S.M. Jackson, and R.P. Smith, Paleoseismology of Volcanic Environments: Introduction. Volcano-Extensional Structures. Criteria for Field Recognition of Volcano-Extensional Features. Paleoseismological Implications and Methods. Conclusions. Chapter 5: G.A. Carver and J.P. McCalpin, Paleoseismology of Compressional Tectonic Environments: Introduction. Geomorphic Evidence of Thrust Paleoearthquakes. Stratigraphic Evidence of Thrust Paleoearthquakes. Paleoseismic Evidence of Secondary Faulting. Paleoseismic Evidence of Coseismic Folding. Paleoseismology of Subduction Zones. Late Quaternary Sea Level. The Coseismic Event Horizon. Paleoseismic Evidence of Coseismic Uplift. Paleoseismic Evidence of Coseismic Subsidence. Chapter 6: R.J. Weldon II, J.P. McCalpin, and T.K. Rockwell, Paleoseismology in Strike-Slip Tectonic Environments: Introduction. Geomorphic Evidence of Paleoearthquakes. Stratigraphic Evidence of Paleoearthquakes. Dating Paleoearthquakes. Interpreting the Paleoseimic History by Retrodeformation. Distinguishing Tectonic from Non-Tectonic Strike-Slip Faults. Chapter 7: S.F. Obermeier, Using Liquefaction-Induced Features for Paleoseismic Analysis: Introduction. Overview of the Formation of Liquefaction-Induced Features. Criteria for an Earthquake-Induced Liquefaction Origin. Historic and Prehistoric Liquefaction--Selected Studies. Features Generally of Nonseismic or Unknown Origin. Estimation of Strength of Paleoearthquakes. Chapter 8: R.W. Jibson, Using Landslides for Paleoseismic Analysis: Introduction. Identifying Landslides. Determining Landslide Ages. Interpreting an Earthquake Origin for Landslides. Analysis of the Seismic Origin of a Landslide. Interpreting Results of Paleoseismic Landslide Studies. Final Comments. Chapter 9: J.P. McCalpin, Application of Paleoseismic Data to Seismic Hazard Assessment and Neotectonic Research: Introduction. Estimating Paleoearthquake Magnitude. Paleoearthquake Slip Rates and Recurrence. Fault Segmentation. Models of Fault Behavior. Models of Earthquake Recurrence. Use of Paleoseismic Data in Deterministic and Probabilistic Seismic Hazard Analyses. Site Studies for Surface Rupture. Paleoseismic Data Applied to Neotectonic Research. Current Issues and Future Prospects in Paleoseismology. Paleoseismology has become an important component of seismic risk analysis, which is mandated for nuclear power plants, dams, waste repositories, and other critical structures. 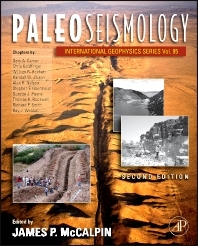 This book is the first in the English language to be devoted solely to paleoseismology. It summarizes the development of the field from the 1960s to the present, encompassing material that is currently widely dispersed in journal articles. Academic researchers in tectonics and seismology and geological/geotechnical consultants in any country with seismic risk. Also, civil engineers, and risk analysts in federal and State agencies. Text adoption potential for courses on 'Geologic Hazards' and 'Neotectonics,' and graduate-level courses on 'Earthquake Hazards'.